I'm the Director of Product design at Counsyl, a DNA testing and genetic counseling service. We look at people's DNA, tell them if they're at risk for health conditions – like childhood diseases and cancer – and help them understand what they can do to get ahead of it. The work shown here is just a small sampling of the public-facing project my team has shipped. It is meant to give you a sense of the projects we've tackled, but is in no way comprehensive. We design services with many parts, including a physical kit that connects with a digital experience. 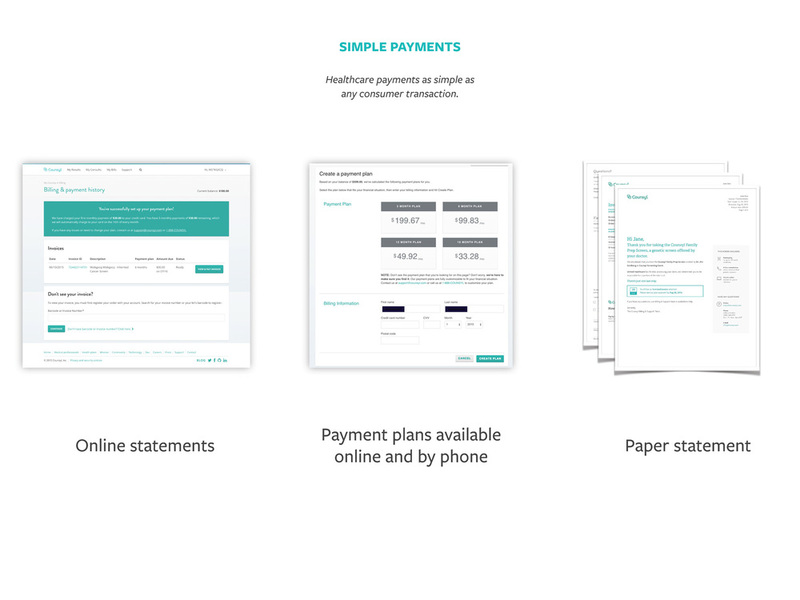 My recent efforts have been focused on bringing transparency to our billing practices, giving patients simple information about their insurance coverage. Saliva tests means that this prescription product can be done from the comfort of a patient's home. Patients getting tested at a clinic receive welcome cards, instructing them on how to access results and counseling online. The onboarding experience for patients. Credit for work goes to colleagues and former colleagues, including: Cavan Riley, Matt Maher, Abi Kelly, Allison Kuperman, Kaitlin Sullivan, Sam Colley, Alok Jethanandani, Albert Treat, Juliana Linder, Trish Ang, Scott Duncombe and Alex Cohen. I have led the team to produce much of the work below, and have noted places where I am directly responsible. Design understands our users and acts as advocates for patients and providers within the organization. Design shares processes to facilitate work, connect employees with the company meeting, and create a culture willing to take reasonable risks. I co-led development of this project with Technical Product Manager Ellen Zwickl. Juliana Linder and Abi Kelly are responsible for UI and UX. Prescribe Design did a case study on the ROI for this project. 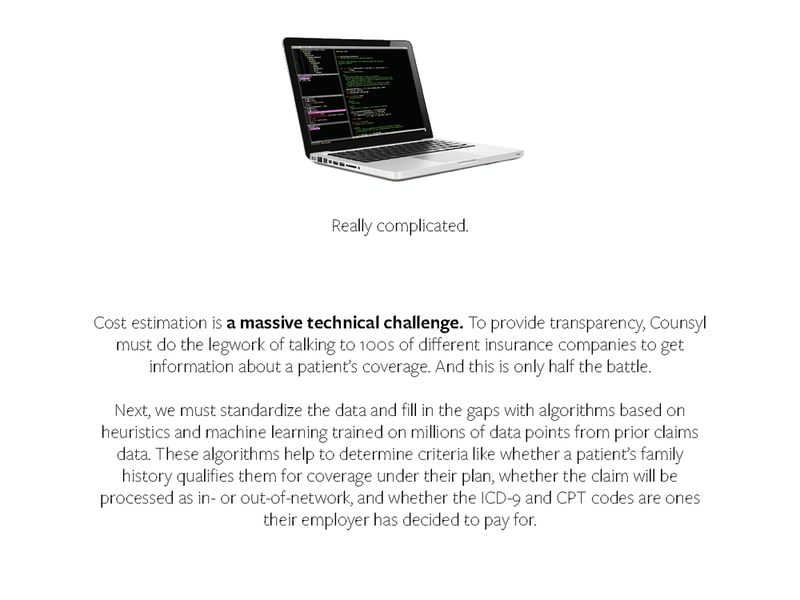 The slides below walk you through the details of what we built, why we built it, and how we measured success. The most iconic part of the testing experience. It has evolved over time to keep pace with our evolving brand and product line. Redesign led by Cavan Riley and Juliana Linder. Updated with new logo, branding, and iconography to make it easier to differentiate between multiple sample types (4mL blood, 10mL blood, saliva). The left and right kits are blood kits for clinics. The center kit is saliva, and meant to be given directly to patients. The directions are integrated directly into the kit, meaning fewer pieces for our team to assemble, and less hassle for clinics. 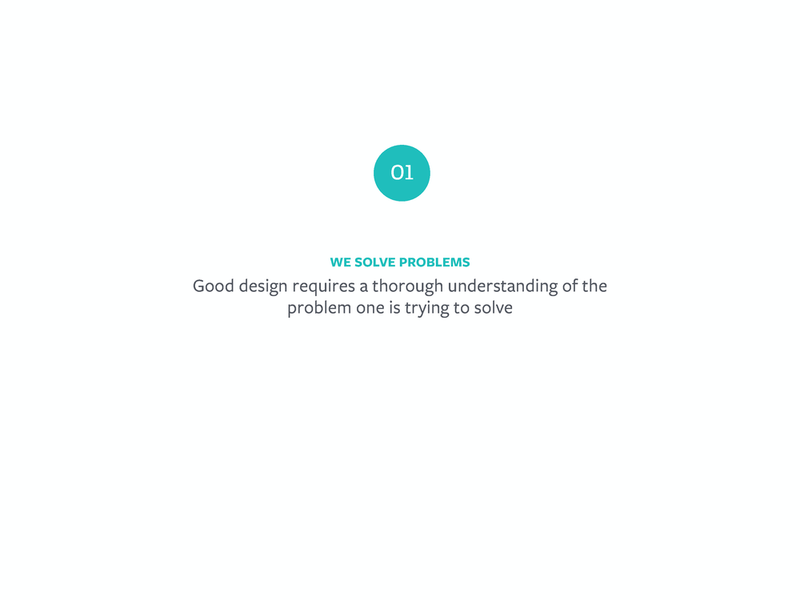 Counsyl has invested in good design from the very beginning. We worked with our clinical team to make a first-of-its kind online genetic counseling service to help patients learn about how to interpret their results. The Counsyl website contains a full list of recent press coverage. Highlights are listed below. Fast Company cited the strategic importance of the design work my team does when covering Counsyl in one of its annual design issues. 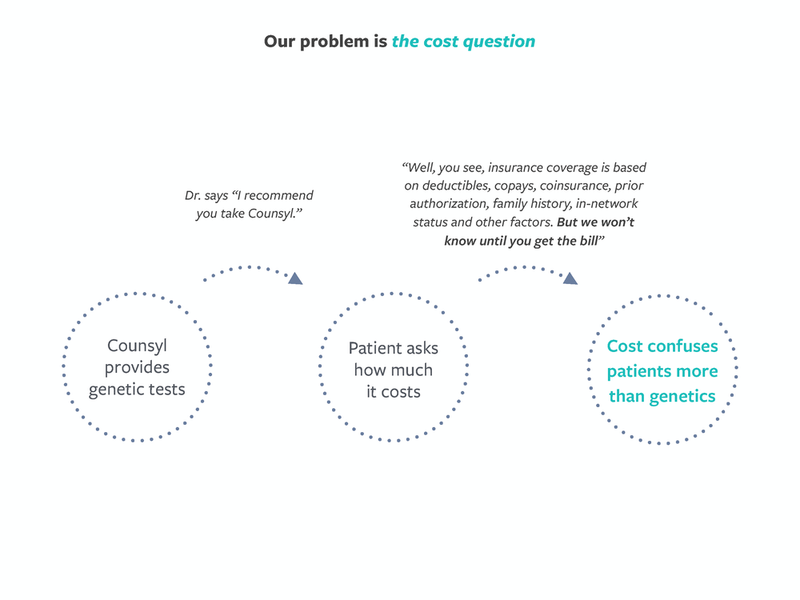 THE REVOLUTIONARY LAB COUNSYL IS MAKING GENETIC TESTING AFFORDABLE, FAST, AND FRIENDLY. MIT Tech Review named Counsyl one of the 50 Smartest Companies in 2015.